Home » Mental Health » Is It Bipolar Disorder or ADHD? ADHD (Attention Deficit Hyperactivity Disorder) is defined by distinct traits, such as hyperactivity, distractibility, poor concentration, impulsivity, racing thoughts, sleep disturbances, frustration, and self-doubt. However, these characteristics are also found in people with Bipolar disorder, often making it difficult to distinguish between the two. Bipolar disorder often co-occurs in nearly 20% of diagnosed ADHD cases. This makes an accurate diagnosis especially important, because untreated bipolar disorder can lead to public and self-harm, and suicidal thoughts. Moreover, not treating bipolar disorder first can worsen ADHD symptoms in cases where both conditions occur together. ADHD is a life-long condition that most commonly occurs during childhood. Symptoms of hyperactivity, distractibility, and poor concentration, among others, first appear by age 12 in most children. Mild signs of Bipolar disorder, on the other hand, tend to appear after age 18, with stronger, more defining symptoms apparent by age 26 or more. However, the condition may actually start developing early on in children with ADHD, but remain undiagnosed due to mild symptoms. In such cases, it is known as ‘Early-Onset Bipolar Disorder’. ADHD is a chronic condition whose symptoms are consistently present, without any changes in intensity. It is also primarily a Behavioral Disorder. Mania: Hyperactivity, mood elation, and engaging in risky financial and sexual behaviors, among other traits. It is this phase that is often confused with ADHD. Hypomania: A shorter, watered-down version of mania. Depression: Low energy, sadness, hopelessness, decreased interest in life, and even suicidal thoughts. Mixed Mood: Regular fluctuation between manic and depressive episodes. With ADHD, current events and surroundings have a direct impact on mood and emotions. Happy events lead to elation and excitability, whereas sad events, rejection, criticism, or teasing result in depressive emotions. In people with bipolar disorder, mood shifts occur without any external interference. There is no explainable trigger behind the switch from a manic to a depressive, or hypomanic episode. Mood shifts in ADHD are merely intense versions of otherwise normal emotions. Also, because they are triggered by life events, these shifts can appear spontaneous; the definition by which bipolar moods are popularly perceived. The transition takes much longer, in case of bipolar disorder; from hours and days to weeks, and even months. This is primarily due to the lack of an external trigger. In children, however, the shifts may be more frequent and intense. While the effects may resonate for weeks in response to emotionally intense events, shifts are usually rapid and measured in hours in people with ADHD. Most experience multiple shifts in a single day. However, contrary to popular belief, mood transitions in people suffering from bipolar disorder don’t occur for weeks or months on end. In fact, a positive bipolar diagnosis requires only a minimum of 4 mood shifts within a year. 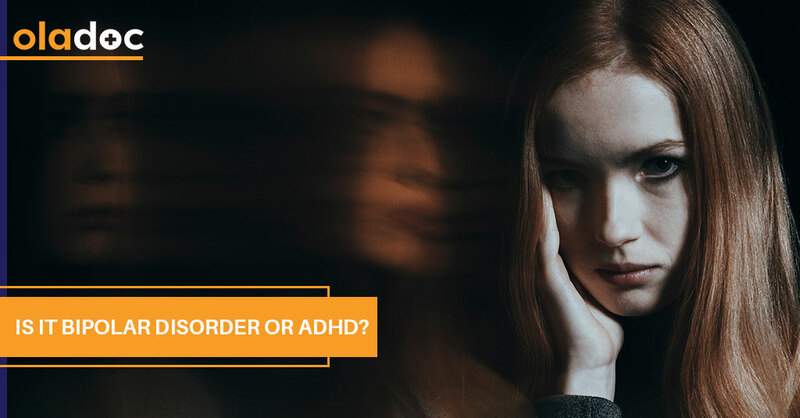 While both are more likely to develop in people with a family history of either condition, ADHD is more common in families with multiple diagnoses of the condition. On the other hand, even 1 or 2 past cases of bipolar disorder can increase the risk of developing the condition in future generations. Both ADHD and bipolar disorder can be easily managed with proper medication and counselling. If you observe the signs of either condition in yourself or someone you love, do not hesitate in reaching out for assistance and support. You can also book an appointment with a top Psychiatrist in Lahore, Karachi and Islamabad through oladoc.com, or call our helpline at 042-3890-0939 for assistance to find the RIGHT Doctor for your mental health concerns. « Bleeding During Pregnancy: What’s Normal, what’s not?